Farmers' decisions in North and South Dakota to plow up grasslands and plant more corn and soybeans has made those states less attractive for commercial beekeeping, the U.S. Geological Survey said in a report available today. "Insect pollinators are critically important for maintaining global food production and ecosystem health, and U.S. insect pollination services have an estimated annual value of $15 billion," said Clint Otto, a scientist at the USGS Northern Prairie Wildlife Research Center and the lead author of the report. The scientists investigated changes in biofuel crop production, including corn and soybeans, and grassland cover surrounding approximately 18,000 registered commercial apiaries in the Dakotas from 2006-2014. Results show a continual increase in biofuel crops totaling 1.2 million hectares, or almost 3 million acres, around apiaries mainly located in the Prairie Pothole Region of the Dakotas. These crops were avoided by commercial beekeepers when selecting apiary sites in the region. The authors explained that conversion of pasture, conservation grasslands and bee-friendly cultivated crops to biofuel crops likely impact both managed and wild pollinators because it reduces forage availability and increases the use of chemicals that negatively affect pollinators and their ecosystem services. "Our study identifies areas within the Northern Great Plains that managers can target for honey bee habitat conservation," Otto said. This research is important because one of the key goals of the Pollinator Health Task Force strategy is to establish 7 million acres of pollinator habitat by 2020, USS noted. 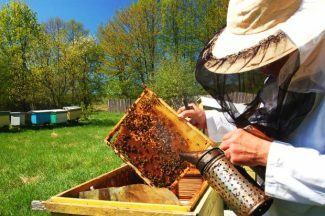 Most of the commercial honey bee colonies that spend the summer in the Dakotas provide pollination services for crops such as almonds, melons, apples and cherries elsewhere in the U.S. According to the report, the Northern Great Plains have served as an unofficial refuge for commercial beekeepers because of their abundance of uncultivated pasture and rangelands, and cultivated agricultural crops such as alfalfa, sunflower and canola that provided forage for bees.